Character map shows the icon at U+E93D in this font. 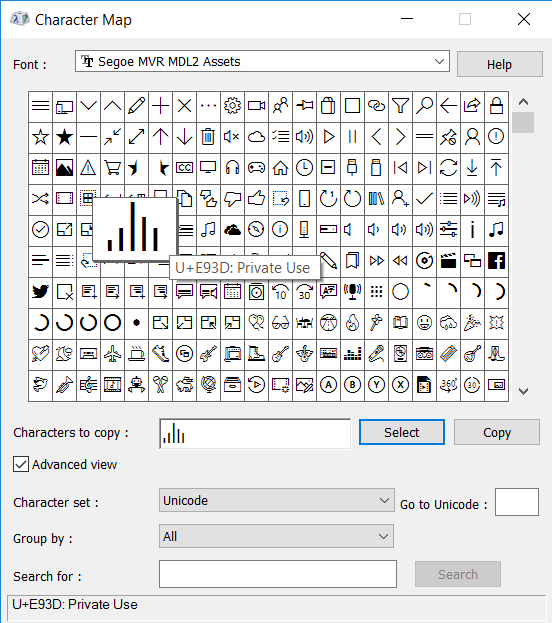 Thinking back about this issue, how does the groove music app actually read the Segoe MVR MDL2 assets font, since it is not installed in the windows fonts folder? I'm asking because I assembled a custom iconfont specific to my configuration, which of course has to be installed in the windows fonts folder before I run foobar2000. Is there a way to make this font available to my foobar2000 without the need to install it, just like the the Segoe MVR MDL2 is available to Groove music without being installed (apparently, at least)? Installing a font is a one-time operation. Why wouldn't that work for you? I'm probably lacking some basic knowledge on font installation, but I thought they could only be installed in the windows/fonts folder, which is the target folder when you click on the install button. How do you install a font in a different folder? Can I install a font in the foobar2000 folder, for instance? Furthermore Segoe MVR MDL2 Assets is not available to other apps, but groove music, that's why II thought it is not a proper installation. I would like my custom iconfont also to be available to foobar2000 only. Is that possible? I never said it doesn't, but hopefully you will understand my concern better, after reading above. BTW, just for the record, I'm the same davideleo here. One could put a font file there, or anywhere, and it might be possible to program an application to access it. If so, Peter would have to provide the hook. Furthermore Segoe MVR MDL2 Assets is not available to other apps, but groove music, that's why I thought it is not a proper installation. It is a proper installation for a font Microsoft wants to hide from prying eyes. I would like my custom iconfont also to be available to foobar2000 only. Is that possible? It may be, as I alluded to above. At least now I see why you don't want to install your font with all the others. While I don't agree that it's necessary, you do seem to have Microsoft on your side. That occurred to me well after the deadline for editing my post. I had completely forgotten why I bookmarked the page I linked to. What I'm actually looking forward is to make my portable installation fully portable. I know it's a little detail and it only takes a few seconds, but having to install the font before I can actually run foobar2000, kind of bugs me. It is of course a one-time operation, as you said, but a few days ago I was testing my configuration, which runs some windows 10-specific scripts, on the windows 7 machine I have in the office and where I'm not totally comfortable installing weird iconfonts with fancy music player names. It's not really a practical problem: after fixing the scripts I uninstalled the fonts and deleted the portable installation foobar2000 copy, but that triggered my concern. As a fallback I will try to automate the font installation with jscript, but I guess this is really off topic for the columns ui appearance thread. Does anybody know if into the "Item Details" panel of CUI it is possible to show small pictures? Not more than ten and they are all of the same size. If yes, please give me some example. In the panel wiki there are non indications.